Another mass shooting that -- this time, at a high school in Parkland, Florida -- has changed the infamous rankings of the deadliest mass shootings in the nation's modern history. On Wednesday, it was at Marjory Stoneman Douglas High School in Broward County. In November, it was in a church in Texas. In October, it was at a country music festival in Nevada. The list of the deadliest mass shootings spans 52 years and six states. 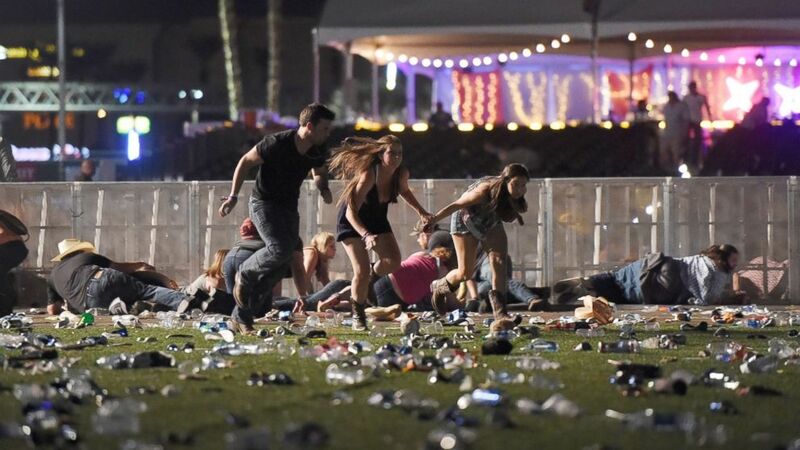 Four of the five worst gun massacres on the list -- including the deadliest, at a concert in Las Vegas -— occurred in just the past year and a half. The country "has experienced an increase in mass casualty attacks" wrought by mentally troubled individuals "who commit mass murder in furtherance of some perceived grievance or ideological cause," John Cohen, a former counterterrorism coordinator for the Department of Homeland Security and a consultant for ABC News, said after the massacre in Las Vegas, in which 58 people were killed. ABC News has compiled a list of the 11 deadliest mass shootings, which includes some incidents that had the same death tolls. (David Becker/Getty Images) People run from the Route 91 Harvest country music festival, Oct. 1, 2017, in Las Vegas. Stephen Paddock, from Mesquite, Nevada, was identified by authorities as the shooter holed up in a Mandalay Bay Resort and Casino hotel suite, packing as many as 19 guns. Around 10 p.m. he opened fire on thousands of country music concert attendees across the street below, killing 58 people; more than 500 others were injured. 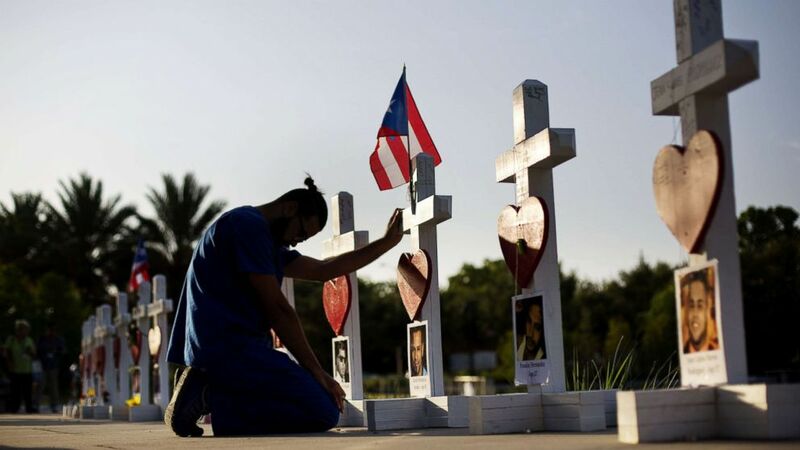 (David Goldman/AP Photo) Ernesto Vergne prays at a cross honoring his friend Xavier Emmanuel Serrano Rosado and the other victims at a memorial to those killed in the Pulse nightclub mass shooting a few blocks from the club early Friday, June 17, 2016, in Orlando, Fla. Gunman Omar Mateen killed 49 people. Around 2 a.m. Omar Mateen, a 29-year-old former security guard, opened fire and killed 49 people who were in an Orlando gay nightclub called Pulse. During the rampage, Mateen, a U.S. citizen, was killed by responding police in a shootout. His ISIS-inspired hate crime injured more than 50 other people. Law enforcement sources told ABC News that Omar Mateen's wife, Noor Mateen, had tried to dissuade him from committing the act. She was charged with aiding and abetting him, as well as committing obstruction. Noor Mateen has pleaded not guilty. (Alan Kim/The Roanoke Times/AP) An injured person is carried out of Norris Hall at Virginia Tech in Blacksburg, Va., April 16, 2007. Seung-Hui Cho, a senior at the school, killed 32 people before taking his own life. 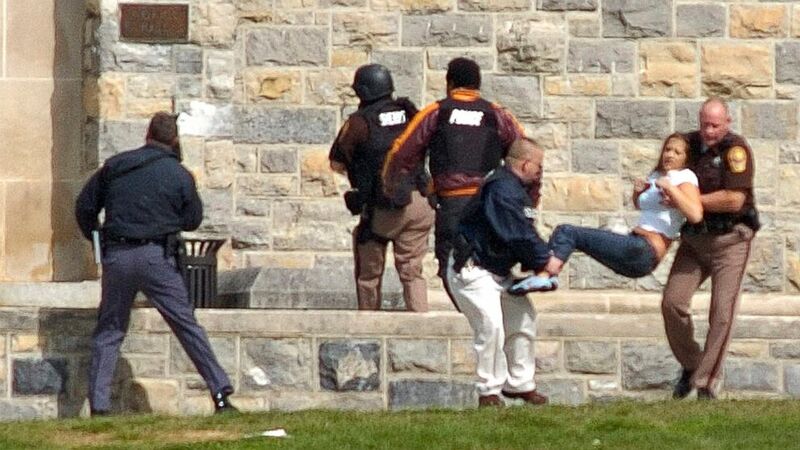 Virginia Tech senior Seung-hui Cho, 23, purchased a 9-mm Glock handgun on March 13, 2007, and a .22-caliber gun within a week before he started shooting people at the Blacksburg campus, including five professors and 26 fellow students. The South Korean–born Cho began his rampage in a dorm room, where two students were shot and killed. According to police, he rearmed at his dorm room and left a note before going out and killing 30 more people in four classrooms, He then turned a gun on himself. 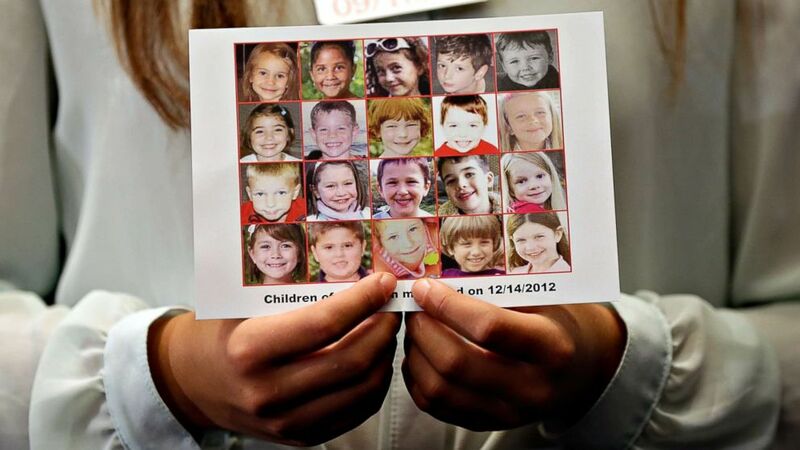 (Win McNamee/Getty Images) Kyra Murray holds a photo showing victims of the shooting at Sandy Hook Elementary School during a press conference at the U.S. Capitol calling for gun reform legislation, Sept. 18, 2013, in Washington, D.C.
Adam Lanza was 20 years old when he entered Sandy Hook Elementary School wearing a bulletproof vest and armed with a semiautomatic rifle and two semiautomatic handguns — a Glock and a Sig Sauer. He breached the school by shooting out a window pane of the front office, then gunned down and killed 26 people, including 20 first-graders and six adult school staff members. Not included in the death count is Lanza's mother, Nancy Lanza, who police say was slain before he arrived at the school, as well as Adam Lanza, who took his own life at the school. 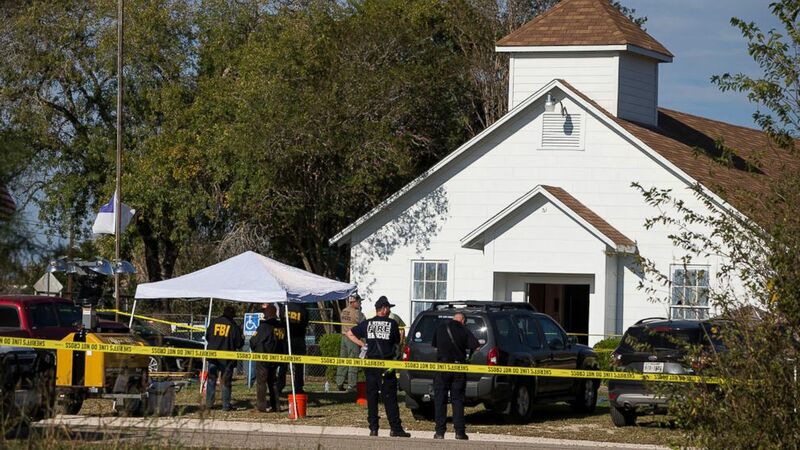 (Nick Wagner/Statesman.com via AP) Law enforcement officials works at the scene of a fatal shooting at the First Baptist Church in Sutherland Springs, Texas, Nov. 5, 2017. At least 26 people were killed and 20 others were injured when a shooter opened fire at the First Baptist Church of Sutherland Springs. Further details of the shooting in the rural community, about 30 miles southeast of San Antonio, were not immediately clear. After slamming his Ford Ranger truck into the window of Luby's Cafeteria, 35-year-old George Jo Hennard said, according to The Killeen Daily Herald, "This is what the women of Bell County made me do." He then started firing his guns and murdered 23 people and left 20 more wounded. Ten of Hennard's victims were killed by single shots to the head. Once police responded, Hennard retreated to a restroom, where he killed himself. James Oliver Huberty entered the fast food restaurant armed with a long-barreled Uzi, a pump-action shotgun and a handgun and took the lives of 21 adults and children and injured 19 others, including an elderly person and a baby, according to The San Diego Tribune. An hour after the shootings, a police sharpshooter killed Huberty, reported the Tribune. Before he went out to commit mass murder, he reportedly told his wife, "I'm going hunting ... hunting for humans," according to The New York Daily News. 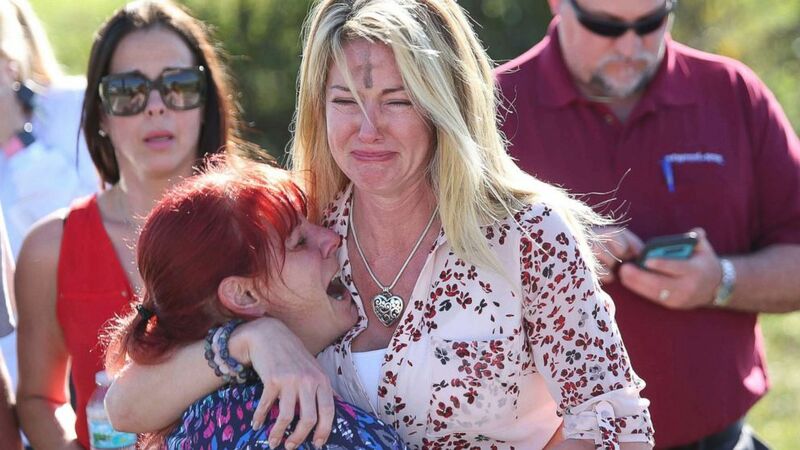 (Joel Auerbach/AP) Women embrace in a waiting area for parents of students after a shooting at Marjory Stoneman Douglas High School in Parkland, Fla., Feb. 14, 2018. A former student who had been expelled from a Florida high school returned to the campus and opened fire both inside and outside of the school, at times firing through the glass windows of classroom doors. Authorities arrested 19-year-old Nikolas Cruz, who had been expelled from Marjory Stoneman over disciplinary problems, in the aftermath of what has become the deadliest school shooting since an attack on an elementary school in Newtown, Connecticut, in 2012. There were 17 people killed in the Valentine's Day shooting and more than a dozen others were injured, some critically. (AP Photo) Sgt. 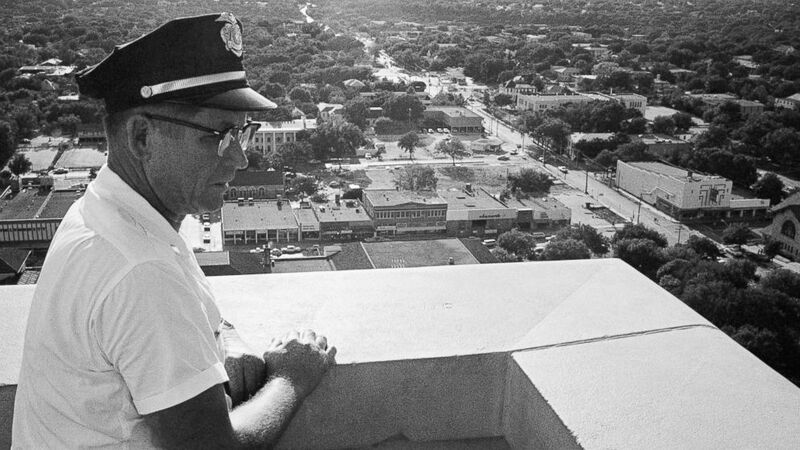 Robert W. Turner, 50, of the University of Texas police, looks at the spot on the observation tower of the administration building where Charles J. Whitman was gunned down by police in Austin, Aug. 1, 1966. Whitman, a 28-year-old engineering student and Marine-trained sniper, opened fire from the clock tower killing 14 people. U.S. Marine sniper Charles Joseph Whitman lugged a cache of rifles, pistols and a sawed-off shotgun up to the observation deck of the university's landmark clock tower. He then fired at will, striking unsuspecting students. He killed 14 people and wounded at least 30 others. Whitman's terror was ultimately foiled after police officers Ramiro Martinez and Houston McCoy shot him dead. Including the murders of his wife and mother, whom he killed earlier that day, the death toll stands at 16. 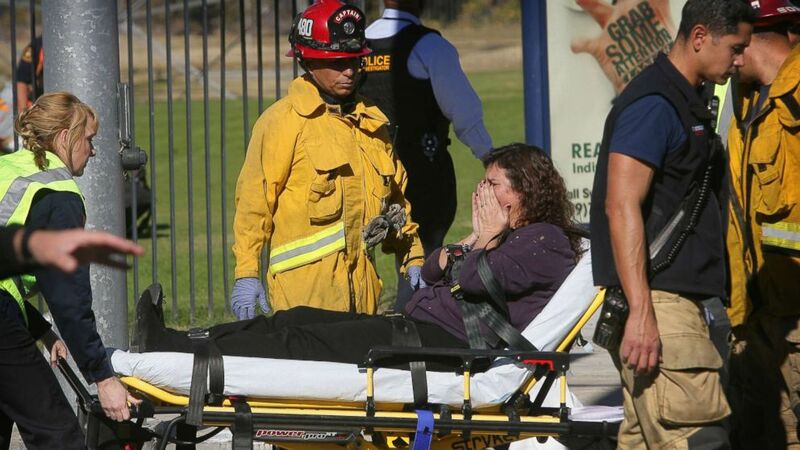 (David Bauman/The Press-Enterprise via AP) A victim is wheeled away on a stretcher following a shooting that killed 14 people at a social services facility, Dec. 2, 2015, in San Bernardino, Calif. Husband and wife Syed Rizwan Farook, 28, and Tashfeen Malik, 27, dressed in tactical gear and armed themselves with assault rifles and pistols when they entered a mandatory Christmas party at a social services center where Syed worked, fatally shot 14 of his unarmed colleagues and left at least 17 others injured. The couple then fled the center and died in a hail of bullets on a San Bernardino street when police caught up to their car. On the day of the attack, FBI agents later confirmed, the couple researched ISIS leader Abu Bakr al-Baghdadi online. Patrick Henry Sherrill, 44, was a part-time postman who returned to his office a day after receiving a poor performance review. Armed with three handguns, he entered the federal building through the back and shot anyone in sight. He murdered 14 fellow postal workers 10 minutes before fatally shooting himself in the head. Authorities later determined Sherrill was angry that he might lose his job.